Today's popularity boom of consumer genetic testing to determine ancestry and cultural heritage has become a growing industry. It seems that nearly everyone wants to know more about their backgrounds and their culture. This interest is also spilling over into an interest in a native country's cultural folk art. According to the Museum of International Folk Art, the word "Folk Art" expresses cultural identity by conveying shared community values and aesthetics. "Folk Art" actually encompasses a range of utilitarian and decorative media, including cloth, wood, paper, clay, metal and more. Because of this growing ancestral curiosity, the FabricLink Network begins a series of stories encompassing the textile fibers and fabrics from a variety of countries to encourage an interest in traditions, cultural identity, community, and aesthetics. 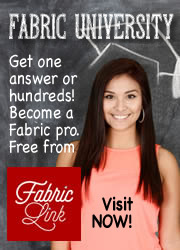 If you have a suggestion and information on a Cultural Fork Art that you would like to see featured on FabricLink.com, please contact Kathlyn Swantko at: KGSwantko@fabriclink.com. 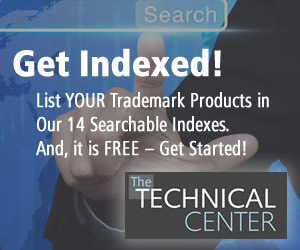 The first culture that FabricLink features is Scandinavia. Since I am a descendent of Norwegian and Swedish immigrants, it was only natural that this would be a logical starting point for our new "Cultural Folk Art" feature. 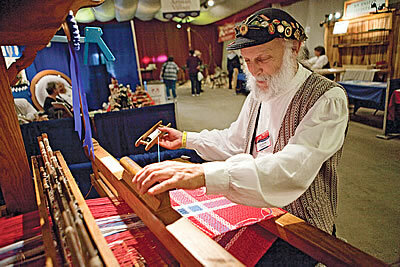 A variety of Cultural Folk Art classes are showcased each year at the popular Scandinavian festival, Norsk Høstfest. This event is held annually in September in my hometown of Minot, ND. 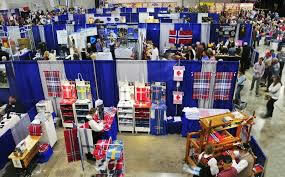 The Norsk Høstfest was founded in 1978 by a group of friends who shared an interest to celebrate their Nordic heritage. The festival, now in its 41st year, has grown to become North America's largest Scandinavian festival attracting thousands of people from all over the world. Norsk Høstfest celebrates the Scandinavian culture and heritage of the five Nordic countries of Denmark, Finland, Iceland, Norway, and Sweden. The individual styles of each country's entertainment, authentic Scandinavian cuisine, handcrafted Norsk merchandise, clothes, art, jewelry, and Scandinavian culture are on display throughout Norsk Høstfest, as well as in the Scandinavian Heritage Park, the only park in the world representing all five Nordic countries. Høstfest University consists of educational classes offers a unique hands-on learning opportunity to attendees of Norsk Høstfest. Accomplished instructors well recognized in their areas of expertise teach Scandinavian folk art classes in their areas of expertise including rosemaling, wood carving, jewelry design, fiber arts and more. Instructors share their skills in a small group classroom setting where students receive personalized assistance and complete a project to take home. For this first feature, FabricLink covers authentic Nordic textile artistries that were offered at Høstfest University 2017.